Stainless steel area drains are manufactured by StainlessDrains.com in several configurations to meet customers' needs for drainage in specific areas that do not require a trench drain or floor sink. These commercial floor drains are used in installations that do not experience constant heavy flows, including restrooms, shower facilities and interior overflow areas. They also provide overflow protection in kitchens and manufacturing plants. StainlessDrains.com offers two standard stainless steel area drains for your specific application. The 6" area drain is intended for low flow areas, when trench or floor drains are not necessary. The 8" area drain is ideal for medium flow applications, such as in warehouses and factories. Drains for low flow areas and are ideal for use under condensate lines. Heavy-duty grates for high traffic areas, and trap primer connectors are available. Drains for medium flows. Heavy-duty grates are designed to withstand fork-lift traffic in warehouses and factories. Sediment baskets and trap primer connectors are available. All stainless steel area drains manufactured by StainlessDrains.com meet U.S. FDA standards, are sanitary and corrosion-resistant. Custom designs are also available and our team will work with each customer to recommend the correct commercial floor drain for each job. 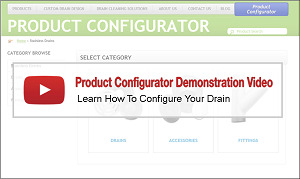 Custom and standard drains are priced competitively, with no up-charge for custom drains.